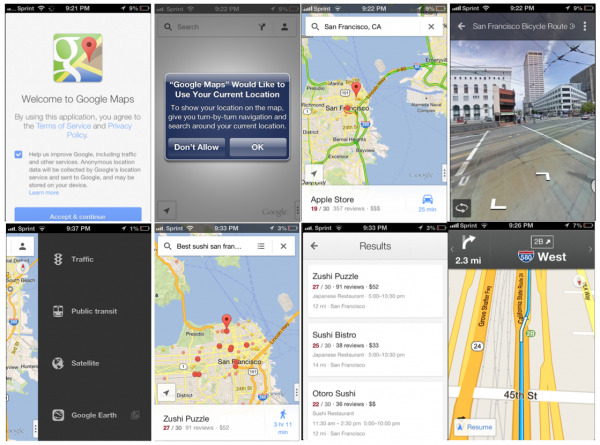 Back in September Apple announced its removal of the native Google Maps mobile application from iOS 6. This was a controversial topic to say the least and in the end it may have helped Google far more than it helped Apple. The mobile application that Apple replaced Google Maps made Google’s iOS Maps application that much more successful. The Google Maps mobile application is in the Apple Store and it is stunning. 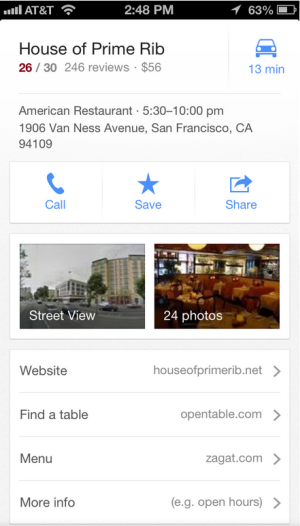 iOS users didn’t just get Google Maps, they got a revamped and improved application that will only get better. The Google Map app for iOS has already crossed the 10 million download mark after just 48 hours of it’s release. Quite astonishing! The app can be downloaded from here. Here is an overview of the various changes and updates. 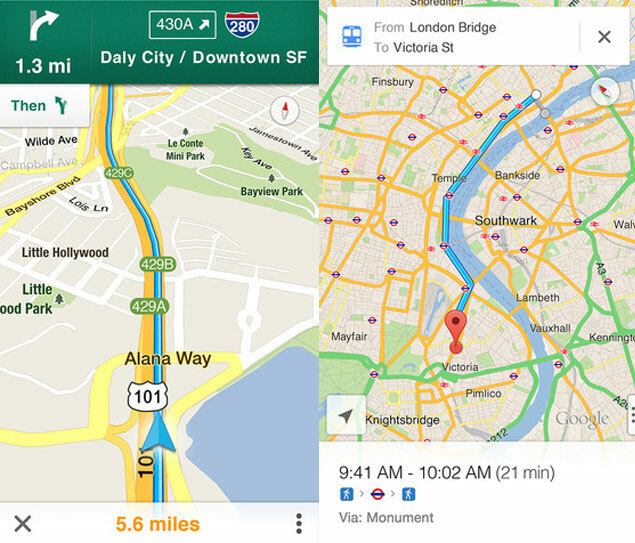 Google held nothing back when they built Google Maps for iOS. The development team at Google came together and created something that uses all of the available elements and gestures available with iOS. The result is a product that surpasses its predecessor as well as its Android counterpart by leaps and bounds. The first thing you should notice about the new UI is that there is no menu. Everything is built into the vector based map and called forth using gestures. The mobile application has been made responsive and snappy by using OpenGL to build it. OpenGL is typically used for graphic intensive programs like videogames or flight simulations, so you can imagine what it does in this app. The new feature that has been dubbed “info sheet” plays a big role in what allows Google Maps for iOS to have no static menu. If you swipe up from the bottom of your screen you will see a menu that displays information from Google+ Local, this is the info sheet. When you are searching for a service, location or address the info sheet will give you information on your results that will help you choose the best location, route or choice to fit your needs. There is also a look around mode that will show you pictures that people have taken of the location as well as a 3D model of the inside of the venue. Both of these functions are graphic intensive, but with the brilliant setup from Google it loads and moves as smoothly as scrolling through a page. Once you have chosen your destination the new and improved navigation takes over. It allows you to change your and it will give you the choice of various routes that are all set up with current real time traffic conditions and travel times. Once you pick your route you are greeted by a familiar voice. Some of you may recognize the Voice of the Google Now Assistant as she guides you through your route turn by turn. Considering the lack of this function is one of the leading causes for Apple dropping the Google Maps native application, this one was a surprise. If you tap on the time and miles located at the bottom of the map, it will even show you where you are on your journey. It is important to note for those of you who may not be using Apples newest phone, Google Maps actually works on lower end iOS devices. This is a huge deal for many of those that were unable to use the Apple Map application due to hardware requirements. When Apple elected to drop native support for transit and walking directions, many users were perturbed to say the least. These features have many big city iOS users singing Google’s praises now that they no longer need numerous apps that don’t interact with each other just to get around their home city. Why Apple chose to remove something so crucial without replacing it is beyond our ken, but with Google Maps we have a great fix for the problem. These features have been improved upon since we last saw them. Google has increased their speed and functionality. I am still absolutely shocked that Apple released a product that not only was dysfunctional, but in many cases proved dangerous. The Australian police have even gone as far as to warn their populace against Apple Maps stating that it offers potentially life threatening misdirection. This is extremely uncharacteristic of the mobile development company that we have come to expect top of the line product from. Google Maps for iOS is a great application that just shows who is the top dog in this arena. There are a few features that were not included in the initial rendition of the mobile application, but there is a definite feel of more to come in the near future. The potential for Google+ to become fully integrated with all of its social components may be just what Google has needed to make their social network what they hoped it would be. I want to applaud Google for their work here. When they saw the opportunity on iOS devices, they didn’t just pack up their existing application and send it on over to the Apple Store. They stepped up to the plate and knocked it out of the park. There is more they can do with Google Maps and I truly hope that Android users can expect to see similar product and dedication coming their way soon. Seeing the loving iOS is getting has made more than a few Android users a fair bit jealous. Apple Store: Are They Taking The App Out of hAPPiness? Stephen Barnum is a professional blogger and writer at http://morointeractive.com. He is passionate about technology and learning. His hope is to share what he has learned with his readers. For inquiries email him at sbarnum@morointeractive.com.